Observations: 93:1 This short psalm opens with praise of the everlasting God's sovereign rule, and for His majesty and strength/power. This, and the following six psalms were considered by Jewish scholars to apply to the times of the Messiah. God's rule will find it's fullest expression in the Messiah, but He rules for the benefit of and in the lives of His people throughout all ages. 93:2-3 The world is established and immoveable, and so is God's throne/rule. What He has mandated will always occur. In fact, He is everlasting. Now that's permanent. 93:3-4 God is easily mightier than the seas (Hebrew = “Yamm”). This is possibly a polemic against Baal Hadad (whose symbol was a bull). In Canaanite mythology Baal Hadad was the son of Dagon, and barely defeats Prince Yamm, the sea god to gain Asherah and the kingship. Yahweh is far greater than the Yamm. 93:5 God is not only mighty above all, His rule stands firm (nothing overcomes it), and holiness (one of a kind separateness from all other gods) is the fitting adornment of His house/dynasty, which will endure (unlike Baal). Application: Trust in God's rule and strength, because there is no end to them. Prayer: Mighty God, in the midst of the temporary turmoils of my life, I will remember and know that You are the eternal, sovereign and mighty God, and trust and act accordingly. Amen. Pr 22:6 “Train up a child in the way he should go, and when he is old he will not depart from it. 7 The rich rule over the poor. The borrower is servant to the lender. 8 He who sows wickedness reaps trouble, and the rod of his fury will be destroyed. 9 He who has a generous eye will be blessed; for he shares his food with the poor. 10 Drive out the mocker, and strife will go out; yes, quarrels and insults will stop. Observations: Although these proverbs have multiple applications, allow me to draw out a few parenting observations, for present and future parents. See Truthbase.net for more on Biblical parenting. 22:6 Training is more than telling the what; it's also showing the why. If parents fail to sell their kids on the superiority of God's way, by not only buying it themselves (and modeling it), and demonstrating why alternatives are false, then the kids will be tempted by deception of alternative paths. If parents merely push the tradition or party line without proving its basis in truth (Truthbase to the rescue! ), or the Biblical way, then the kids will waver in the winds of opposition, and jump ship. 22:8 A parent reaps what their spouse has sown :) Kids learn submission by observing how their parents relate. Kids and people tend not to rebel against just authorities. 22:10 Allowing disrespectful behavior breeds strife. Fighting and winning against every rebellion initially takes more effort, but is the only way to peace. Application: If you don't like your harvest of radishes, sow something different, like strawberries. Prayer: God of Justice and Truth, You are the perfect parent; help me model my parenting after Your parenting of me. Amen. Lamentations 1-5 This is a minor book of the major prophet Jeremiah, recording his responses to the fall of Jerusalem. It provides good insight into how to respond to stupid suffering (painful consequences of our independence). The first four chapters are alphabetic acrostics, with each verse beginning with the 22 successive letters of the Hebrew alphabet. The third chapter is a triple acrostic, with each group of three verses beginning with the successive letters (1a 2a 3a; 4b 5b 6b; 7c 8c 9c; etc). The final chapter is more of a prayer, in which the acrostic format is abandoned, but it still contains 22 verses. The famous hymn, “Great is Thy Faithfulness” comes from 3:22-23. 1:1 How the city sits solitary, that was full of people! She has become as a widow, who was great among the nations! She who was a princess among the provinces has become tributary! 2 She weeps bitterly in the night, and her tears are on her cheeks; among all her lovers she has none to comfort her: All her friends have dealt treacherously with her; they are become her enemies. 3 Judah is gone into captivity because of affliction, and because of great servitude; she dwells among the nations, she finds no rest: all her persecutors overtook her within the straits. 4 The streets of Zion do mourn, because none come to the solemn assembly; all her gates are desolate, her priests do sigh: her virgins are afflicted, and she herself is in bitterness. 5 Her adversaries are become the head, her enemies prosper; for Yahweh has afflicted her for the multitude of her transgressions: her young children are gone into captivity before the adversary. 6 From the daughter of Zion all her majesty is departed: her princes are become like harts that find no pasture, they are gone without strength before the pursuer. 7 Jerusalem remembers in the days of her affliction and of her miseries all her pleasant things that were from the days of old: when her people fell into the hand of the adversary, and no one helped her, The adversaries saw her, they mocked at her desolations. 8 Jerusalem has grievously sinned; therefore she has become as an unclean thing; all who honored her despise her, because they have seen her nakedness: yes, she sighs, and turns backward. 9 Her filthiness was in her skirts; she didn’t remember her latter end; therefore is she come down wonderfully; she has no comforter: see, Yahweh, my affliction; for the enemy has magnified himself. 10 The adversary has spread out his hand on all her pleasant things: for she has seen that the nations are entered into her sanctuary, concerning whom you commanded that they should not enter into your assembly. 11 All her people sigh, they seek bread; they have given their pleasant things for food to refresh the soul: look, Yahweh, and see; for I am become abject. 12 Is it nothing to you, all you who pass by? Look, and see if there is any sorrow like my sorrow, which is brought on me, With which Yahweh has afflicted me in the day of his fierce anger. 13 From on high has he sent fire into my bones, and it prevails against them; he has spread a net for my feet, he has turned me back: he has made me desolate and faint all the day. 14 The yoke of my transgressions is bound by his hand; They are knit together, they have come up on my neck; he has made my strength to fail: The Lord has delivered me into their hands, against whom I am not able to stand. 15 The Lord has set at nothing all my mighty men in the midst of me; he has called a solemn assembly against me to crush my young men: The Lord has trodden as in a winepress the virgin daughter of Judah. 16 For these things I weep; my eye, my eye runs down with water; Because the comforter who should refresh my soul is far from me: my children are desolate, because the enemy has prevailed. 17 Zion spreads forth her hands; there is none to comfort her; Yahweh has commanded concerning Jacob, that those who are around him should be his adversaries: Jerusalem is among them as an unclean thing. 18 Yahweh is righteous; for I have rebelled against his commandment: Please hear all you peoples, and see my sorrow: my virgins and my young men are gone into captivity. 19 I called for my lovers, but they deceived me: my priests and my elders gave up the spirit in the city, While they sought them food to refresh their souls. 20 See, Yahweh; for I am in distress; my heart is troubled; my heart is turned within me; for I have grievously rebelled: Abroad the sword bereaves, at home there is as death. 21 They have heard that I sigh; there is none to comfort me; All my enemies have heard of my trouble; they are glad that you have done it: you will bring the day that you have proclaimed, and they shall be like me. 22 Let all their wickedness come before you; Do to them, as you have done to me for all my transgressions: For my sighs are many, and my heart is faint. Observations: 1:1-11 Jeremiah laments the affliction of Judah, which was due to her sin against Yahweh (as promised). 1:12-17 The most devastating thing about being judged by God for sinning against Him is that there is no source of comfort other than the One we've alienated. 1:18-22 Jeremiah does what all suffering for stupidity need to do: on behalf of the people, he confesses that God is righteous and they have rebelled. He also asks God to afflict their tormentors, something a just God will always do. Application: When reaping the consequences of rebellion against God, the sooner we confess our sin, the sooner we're on the path to restoration. Prayer: Lord, may I be quick to recognize and confess my sin, and never be so stupid as to arrogantly or presumptuously rebel against You. Amen. 2:1 How has the Lord covered the daughter of Zion with a cloud in his anger! He has cast down from heaven to the earth the beauty of Israel, And hasn’t remembered his footstool in the day of his anger. 2 The Lord has swallowed up all the habitations of Jacob, and has not pitied: he has thrown down in his wrath the strongholds of the daughter of Judah; he has brought them down to the ground; he has profaned the kingdom and its princes. 5 The Lord has become as an enemy, he has swallowed up Israel; 6 He has violently taken away his tabernacle...Yahweh has caused solemn assembly and Sabbath to be forgotten in Zion, has despised in the indignation of his anger the king and the priest. 7 The Lord has cast off his altar, he has abhorred his sanctuary; he has given up into the hand of the enemy the walls of her palaces: 9...Her king and her princes are among the nations where the law is not; Yes, her prophets find no vision from Yahweh. 13 What shall I testify to you? what shall I liken to you, daughter of Jerusalem? What shall I compare to you, that I may comfort you, virgin daughter of Zion? For your wound is deep like the sea: who can heal you? 14 Your prophets have seen for you false and foolish visions; They have not uncovered your iniquity, to bring back your captivity, but have seen for you false oracles and causes of banishment. 15 All that pass by scoff...saying, Is this the city that men called The perfection of beauty, The joy of the whole earth? 17 Yahweh has done that which he purposed; he has fulfilled his word that he commanded in the days of old; he has thrown down, and has not pitied: he has caused the enemy to rejoice over you; he has exalted the horn of your adversaries. 18 Their heart cried to the Lord: wall of the daughter of Zion, let tears run down like a river day and night; Give yourself no respite; don’t let the apple of your eye cease. 19 Arise, cry out in the night, at the beginning of the watches; Pour out your heart like water before the face of the Lord: Lift up your hands toward him for the life of your young children, that faint for hunger at the head of every street. 20 Look, Yahweh, and see to whom you have done thus! Shall the women eat their fruit, the children that are dandled in the hands? Shall the priest and the prophet be killed in the sanctuary of the Lord? 21 The youth and the old man lie on the ground in the streets; my virgins and my young men are fallen by the sword: you have killed them in the day of your anger; you have slaughtered, and not pitied. 22 You have called, as in the day of a solemn assembly, my terrors on every side; There was none that escaped or remained in the day of Yahweh’s anger: Those that I have dandled and brought up has my enemy consumed. Observations: 2:1-12 Jeremiah laments that Judah is profane/common, just like any other nation without the law or sabbath or Levitical sacrifices (or God's blessing). 2:13-17 There is no basis for comforting Zion; her wound is incurable, because there are no prophets who speak the truth about the causes of Judah's punishment. Instead of uncovering and denouncing sin, they speak pious platitudes about God's pity (which He says He's not going to show). God promised long ago (Dt 28) to bless the faithful and curse the unfaithful, which is why He purposed to give Judah to her enemies. 2:18-22 Jeremiah instructs the people to call upon the Lord and asks the Lord to hear them. Application: Unless we know how we have sinned in violating God's word, we will not be able to repent and reap blessings rather than cursings. Prayer: God thanks that all Your actions are not arbitrary but just, according to what You've revealed in Your word; may I welcome the exposure of iniquity which, left unchecked, would cause unwelcome pain. Amen. 3:1 I am the man that has seen affliction by the rod of his wrath. 2 He has led me and caused me to walk in darkness, and not in light. 3 Surely against me he turns his hand again and again all the day. 4 My flesh and my skin has he made old; he has broken my bones. 8 Yes, when I cry, and call for help, he shuts out my prayer. 14 I am become a derision to all my people, and their song all the day. 15 He has filled me with bitterness, he has sated me with wormwood. 16 He has also broken my teeth with gravel stones; he has covered me with ashes. 17 You have removed my soul far off from peace; I forgot prosperity. 18 I said, my strength is perished, and my expectation from Yahweh. 19 Remember my affliction and my misery, the wormwood and the gall. 20 My soul still remembers them, and is bowed down within me. 21 This I recall to my mind; therefore have I hope. 22 It is because of Yahweh’s hesed/loyal covenantal love that we are not consumed, because his compassion doesn’t fail. 23 They are new every morning; great is your faithfulness. 24 Yahweh is my portion, says my soul; therefore will I hope in him. 25 Yahweh is good to those who wait for him, to the soul that seeks him. 26 It is good that a man should hope and quietly wait for the salvation of Yahweh. 27 It is good for a man that he bear the yoke in his youth. 28 Let him sit alone and keep silence, because he has laid it on him. 29 Let him put his mouth in the dust, if so be there may be hope. 30 Let him give his cheek to him who strikes him; let him be filled full with reproach. 31 For the Lord will not cast off forever. 32 For though he cause grief, yet he will have compassion according to the multitude of his hesed/loyal covenantal love. 33 For he does not afflict willingly, nor (enjoy) grieving the children of men. 34 To crush under foot all the prisoners of the earth, 35 to deny the rights of a man before the face of the Most High, 36 to deprive them of justice (NIV), the Lord doesn’t approve. 37 Who is he who says, and it comes to pass, when the Lord doesn’t command it? 38 Doesn’t evil and good come out of the mouth of the Most High? 39 Why does a living man complain for the punishment of his sins? 40 Let us search and examine our ways, and turn back to Yahweh. 41 Let us lift up our heart with our hands to God in the heavens. 42 We have transgressed and have rebelled; you have not pardoned. 43 You have covered with anger and pursued us; you have killed, you have not pitied. 44 You have covered yourself with a cloud, so that no prayer can pass through. 45 You have made us an off-scouring and refuse in the midst of the peoples. 46 All our enemies have opened their mouth wide against us. 47 Fear and the pit have come on us, devastation and destruction. 48 My eye runs down with streams of water, for the destruction of the daughter of my people. 49 My eye pours down, and doesn’t cease, without any intermission, 50 Until Yahweh look down, and see from heaven. 51 My eye affects my soul, because of all the daughters of my city. 52 They have chased me relentlessly like a bird, those who are my enemies without cause. 53 They have cut off my life in the dungeon, and have cast a stone on me. 54 Waters flowed over my head; I said, I am cut off. 55 I called on your name, Yahweh, out of the lowest dungeon. 56 You heard my voice; don’t hide your ear at my breathing, at my cry. 57 You drew near in the day that I called on you; you said, Don’t be afraid. 58 Lord, you have pleaded the causes of my soul; you have redeemed my life. 59 Yahweh, you have seen my wrong. Judge my cause. 60 You have seen all their vengeance and all their devices against me. 61 You have heard their reproach, Yahweh, and all their devices against me, 62 The lips of those that rose up against me, and their device against me all the day. 63 You see their sitting down, and their rising up; I am their song. 64 You will render to them a recompense, Yahweh, according to the work of their hands. 65 You will give them hardness of heart, your curse to them. 66 You will pursue them in anger, and destroy them from under the heavens of Yahweh. Observations: 3:1-20 Jeremiah laments the loss of the covenantal blessings of peace and prosperity (3:17), the loss of relationship with God, and the pain of affliction. He is down in a massively depressed way. 3:21-41 Instead of reaching for Zoloft, he recalls God's hesed, His loyalty to His covenanted promises to His people who entered into relationship with Him. Almost every version incorrectly translates hesed as loving-kindness. A cursory reading of the passage indicates a God who is anything but “affectionately loving and kind”. He is showing no pity, and is pouring out His just wrath upon the rebels who have been unfaithful to the covenant they swore to follow. Verses 22-23 has a chiastic structure that might help make this clearer: in the Hebrew text, the first verse starts with “hesed” and the second ends with “faithfulness”. The end of the first verse is “compassion” and the second verse begins with referencing God's daily compassion. The inner elements of the structure are about God's compassion, and the outer about His hesed or faithfulness to His covenanted promises (to bless Abraham and Jacob's descendents forever). So hesed and faithfulness are equated, and are the basis for hope in future restoration after the devastating discipline. The central elements of a chiastic structure are usually the most important, and in this case, because of their unfaithfulness, Jeremiah can find major hope in the unfailing, daily renewed compassion of God. If God were not loyal to His promises (hesed), they would be consumed (see observations under next chapter). God doesn't delight in punishment, but causes grief to get His people to repent and turn back to Him. Jeremiah urges people to examine their ways and turn back to God (3:41), lifting their hearts (place where values and decisions reside) and hands (which do or deeds) to God. This is not about singing a song, but committing to decide and do what God wants (essence of repentance). 3:42-66 Jeremiah describes the current situation: they have rebelled and God hasn't pardoned, but punished them for their sins with refusing to answer their prayers and unleashing devastation upon them. Then from verse 48 to the end, he recalls his personal experience of God answering His prayer and saying “Don't be afraid.” He draws comfort from the fact that God brought him up from the lowest pit and paid back his enemies. So He can reverse the situation. Application: Regardless of how bad things get, God's hesed will always cause Him to be loyal to His promises to His people; those who repent can look forward to the peace and prosperity ones. Prayer: Compassionate and faithful God, I praise You for Your hesed, and the hope it gives; I thank You that I can trust You to fulfill Your promises and execute justice. Amen. 4:1 How the gold has become dim! The most pure gold has changed! The stones of the sanctuary are poured out at the head of every street. 2 The precious sons of Zion, comparable to fine gold, How are they esteemed as earthen pitchers, the work of the hands of the potter! 5 Those who were brought up in scarlet embrace dunghills. 6 For the iniquity of the daughter of my people is greater than the sin of Sodom, that was overthrown as in a moment, and no hands were laid on her. 9 Those who are killed with the sword are better than those who are killed with hunger; for these pine away, stricken through, for want of the fruits of the field. 10 The hands of the pitiful women have boiled their own children; they were their food in the destruction of the daughter of my people. 11 Yahweh has accomplished his wrath, he has poured out his fierce anger; he has kindled a fire in Zion, which has devoured its foundations. 12 The kings of the earth didn’t believe, neither all the inhabitants of the world, That the adversary and the enemy would enter into the gates of Jerusalem. 13 It is because of the sins of her prophets, and the iniquities of her priests, that have shed the blood of the just in the midst of her. 16 The anger of Yahweh has scattered them; he will no more regard them: they didn’t respect the persons of the priests, they didn’t favor the elders. 17 Our eyes still fail, looking in vain for our help: In our watching we have watched for a nation that could not save. 18 They hunt our steps, so that we can’t go in our streets: our end is near, our days are fulfilled; for our end has come. 20 The breath of our nostrils, the anointed of Yahweh, was taken in their pits; of whom we said, Under his shadow we shall live among the nations. 21 Rejoice and be glad, daughter of Edom, that dwell in the land of Uz: The cup shall pass through to you also; you shall be drunken, and shall make yourself naked. 22 The punishment of your iniquity is accomplished, daughter of Zion; he will no more carry you away into captivity: he will visit your iniquity, daughter of Edom; he will uncover your sins. 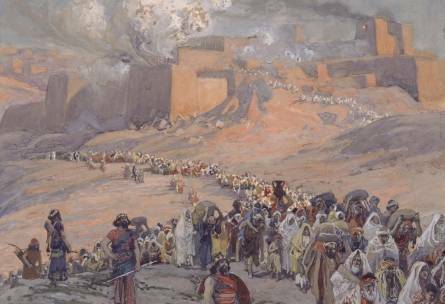 Observations: 4:1-22 Jeremiah describes the conditions during the siege before Jerusalem fell, followed by the causes of it. What was once valued has become nothing since it didn't please God. Judah's sin was worse than that of Sodom and therefore God has poured out His fierce wrath. One's hope in times of God's wrath is not His loving-kindness (if this is kindness, who needs wrath), but His hesed, loyalty to the promises to preserve the seed of Abraham, Jacob, and David, otherwise they would be totally consumed. A major theme of the last half of Jeremiah's book is summed in verse 17, they looked in vain for a nation to save them, when they should have been looking only to Yahweh (because He is the one who judges all nations). The chapter ends with a warning to Edom that although they might be gloating over Judah's demise, they too would suffer exile for their sins like Zion. Application: What some might consider valuable becomes worthless unless it is pleasing in God's sight. Prayer: God, may my highest value be pleasing You, so that I may confidently trust in Your hesed, protection and provision. Amen. 5:1 Remember, Yahweh, what has come on us: Look, and see our reproach. 2 Our inheritance is turned to strangers, our houses to aliens. 3 We are orphans and fatherless; our mothers are as widows. 4 We have drunken our water for money; our wood is sold to us. 5 Our pursuers are on our necks: we are weary, and have no rest. 6 We have given the hand to the Egyptians, to the Assyrians, to be satisfied with bread. 7 Our fathers sinned, and are no more; we have borne their iniquities. 8 Servants rule over us: There is none to deliver us out of their hand. 9 We get our bread at the peril of our lives, Because of the sword of the wilderness. 10 Our skin is black like an oven, because of the burning heat of famine. 11 They ravished the women in Zion, the virgins in the cities of Judah. 12 Princes were hanged up by their hand: The faces of elders were not honored. 13 The young men bare the mill; The children stumbled under the wood. 14 The elders have ceased from the gate, the young men from their music. 15 The joy of our heart is ceased; our dance is turned into mourning. 16 The crown is fallen from our head: Woe to us! For we have sinned. 17 For this our heart is faint; For these things our eyes are dim; 18 For the mountain of Zion, which is desolate: The foxes walk on it. 19 You, Yahweh, remain forever; your throne is from generation to generation. 20 Why do you forget us forever, and forsake us so long time? 21 Restore us to yourself, Yahweh, that we may return. Renew our days as of old. 22 Unless you have utterly rejected us; you are very angry against us. 5:19-22 He concludes with a plea for the everlasting God to restore them back to Himself so they may return to Jerusalem. Unless God has utterly and completely rejected them as a nation, His hesed would demand that He return them, for that is what He promised, just like the judgment that has come upon them was promised. Application: Sin, and its consequences are things to be strenuously avoided (at all costs). Prayer: God, You are always just in all Your dealings. Have mercy on me when I sin, and help me fix my heart on obeying You, so I will never forsake You. Amen. God in a nutshell: God gets very angry when people reject His rule, and absolutely furious when His own people forsake Him. The degree of pain and torment His wrath kindles is terrifying. He is totally loyal to His promises, bringing judgment as promised when people are disobeying Him, and relenting when they repent. He is the only sane basis of trust. His hesed and compassion give hope. God will destroy what He has built, but will never totally abandon His people as a nation. Us in a nutshell: We will reap the consequences of our sins and actions, eventually. Calling out to God in confession and repentance is always a good idea. Usually by the time we start experiencing them, it is too late to repent until the discipline has run its course. 1:1 How the city sits solitary, that was full of people! She has become as a widow, who was great among the nations! She who was a princess among the provinces has become tributary! 2 She weeps bitterly in the night, and her tears are on her cheeks; among all her lovers she has none to comfort her: All her friends have dealt treacherously with her; they are become her enemies. 3 Judah is gone into captivity because of affliction, and because of great servitude; she dwells among the nations, she finds no rest: all her persecutors overtook her within the straits. 4 The ways of Zion do mourn, because none come to the solemn assembly; all her gates are desolate, her priests do sigh: her virgins are afflicted, and she herself is in bitterness. 5 Her adversaries are become the head, her enemies prosper; for Yahweh has afflicted her for the multitude of her transgressions: her young children are gone into captivity before the adversary. 6 From the daughter of Zion all her majesty is departed: her princes are become like harts that find no pasture, they are gone without strength before the pursuer. 7 Jerusalem remembers in the days of her affliction and of her miseries all her pleasant things that were from the days of old: when her people fell into the hand of the adversary, and no one helped her, The adversaries saw her, they mocked at her desolations. 8 Jerusalem has grievously sinned; therefore she has become as an unclean thing; all who honoured her despise her, because they have seen her nakedness: yes, she sighs, and turns backward. 9 Her filthiness was in her skirts; she didn’t remember her latter end; therefore is she come down wonderfully; she has no comforter: see, Yahweh, my affliction; for the enemy has magnified himself. 10 The adversary has spread out his hand on all her pleasant things: for she has seen that the nations are entered into her sanctuary, concerning whom you commanded that they should not enter into your assembly. 11 All her people sigh, they seek bread; they have given their pleasant things for food to refresh the soul: look, Yahweh, and see; for I am become abject. 12 Is it nothing to you, all you who pass by? Look, and see if there is any sorrow like my sorrow, which is brought on me, With which Yahweh has afflicted me in the day of his fierce anger. 13 From on high has he sent fire into my bones, and it prevails against them; he has spread a net for my feet, he has turned me back: he has made me desolate and faint all the day. 14 The yoke of my transgressions is bound by his hand; They are knit together, they have come up on my neck; he has made my strength to fail: The Lord has delivered me into their hands, against whom I am not able to stand. 15 The Lord has set at nothing all my mighty men in the midst of me; he has called a solemn assembly against me to crush my young men: The Lord has trodden as in a winepress the virgin daughter of Judah. 16 For these things I weep; my eye, my eye runs down with water; Because the comforter who should refresh my soul is far from me: my children are desolate, because the enemy has prevailed. 17 Zion spreads forth her hands; there is none to comfort her; Yahweh has commanded concerning Jacob, that those who are around him should be his adversaries: Jerusalem is among them as an unclean thing. 18 Yahweh is righteous; for I have rebelled against his commandment: Please hear all you peoples, and see my sorrow: my virgins and my young men are gone into captivity. 19 I called for my lovers, but they deceived me: my priests and my elders gave up the spirit in the city, While they sought them food to refresh their souls. 20 See, Yahweh; for I am in distress; my heart is troubled; my heart is turned within me; for I have grievously rebelled: Abroad the sword bereaves, at home there is as death. 21 They have heard that I sigh; there is none to comfort me; All my enemies have heard of my trouble; they are glad that you have done it: you will bring the day that you have proclaimed, and they shall be like me. 22 Let all their wickedness come before you; Do to them, as you have done to me for all my transgressions: For my sighs are many, and my heart is faint. 2:1 How has the Lord covered the daughter of Zion with a cloud in his anger! He has cast down from heaven to the earth the beauty of Israel, And hasn’t remembered his footstool in the day of his anger. 2 The Lord has swallowed up all the habitations of Jacob, and has not pitied: he has thrown down in his wrath the strongholds of the daughter of Judah; he has brought them down to the ground; he has profaned the kingdom and its princes. 3 He has cut off in fierce anger all the horn of Israel; he has drawn back his right hand from before the enemy: he has burned up Jacob like a flaming fire, which devours all around. 4 He has bent his bow like an enemy, he has stood with his right hand as an adversary, Has killed all that were pleasant to the eye: In the tent of the daughter of Zion he has poured out his wrath like fire. 5 The Lord has become as an enemy, he has swallowed up Israel; he has swallowed up all her palaces, he has destroyed his strongholds; he has multiplied in the daughter of Judah mourning and lamentation. 6 He has violently taken away his tabernacle, as if it were of a garden; he has destroyed his place of assembly: Yahweh has caused solemn assembly and Sabbath to be forgotten in Zion, Has despised in the indignation of his anger the king and the priest. 7 The Lord has cast off his altar, he has abhorred his sanctuary; he has given up into the hand of the enemy the walls of her palaces: They have made a noise in the house of Yahweh, as in the day of a solemn assembly. 8 Yahweh has purposed to destroy the wall of the daughter of Zion; he has stretched out the line, he has not withdrawn his hand from destroying; he has made the rampart and wall to lament; they languish together. 9 Her gates are sunk into the ground; he has destroyed and broken her bars: Her king and her princes are among the nations where the law is not; Yes, her prophets find no vision from Yahweh. 10 The elders of the daughter of Zion sit on the ground, they keep silence; They have cast up dust on their heads; they have clothed themselves with sackcloth: The virgins of Jerusalem hang down their heads to the ground. 11 My eyes do fail with tears, my heart is troubled; my liver is poured on the earth, because of the destruction of the daughter of my people, Because the young children and the infants swoon in the streets of the city. 12 They tell their mothers, Where is grain and wine? When they swoon as the wounded in the streets of the city, When their soul is poured out into their mothers’ bosom. 13 What shall I testify to you? what shall I liken to you, daughter of Jerusalem? What shall I compare to you, that I may comfort you, virgin daughter of Zion? For your breach is great like the sea: who can heal you? 14 Your prophets have seen for you false and foolish visions; They have not uncovered your iniquity, to bring back your captivity, but have seen for you false oracles and causes of banishment. 15 All that pass by clap their hands at you. They hiss and wag their head at the daughter of Jerusalem, saying, Is this the city that men called The perfection of beauty, The joy of the whole earth? 16 All your enemies have opened their mouth wide against you; They hiss and gnash the teeth; they say, we have swallowed her up; Certainly this is the day that we looked for; we have found, we have seen it. 17 Yahweh has done that which he purposed; he has fulfilled his word that he commanded in the days of old; he has thrown down, and has not pitied: he has caused the enemy to rejoice over you; he has exalted the horn of your adversaries. 18 Their heart cried to the Lord: wall of the daughter of Zion, let tears run down like a river day and night; Give yourself no respite; don’t let the apple of your eye cease. 19 Arise, cry out in the night, at the beginning of the watches; Pour out your heart like water before the face of the Lord: Lift up your hands toward him for the life of your young children, that faint for hunger at the head of every street. 20 Look, Yahweh, and see to whom you have done thus! Shall the women eat their fruit, the children that are dandled in the hands? Shall the priest and the prophet be killed in the sanctuary of the Lord? 21 The youth and the old man lie on the ground in the streets; my virgins and my young men are fallen by the sword: you have killed them in the day of your anger; you have slaughtered, and not pitied. 22 You have called, as in the day of a solemn assembly, my terrors on every side; There was none that escaped or remained in the day of Yahweh’s anger: Those that I have dandled and brought up has my enemy consumed. 3:1 I am the man that has seen affliction by the rod of his wrath. 2 He has led me and caused me to walk in darkness, and not in light. 3 Surely against me he turns his hand again and again all the day. 4 My flesh and my skin has he made old; he has broken my bones. 5 He has built against me, and surrounded me with gall and travail. 6 He has made me to dwell in dark places, as those that have been long dead. 7 He has walled me about, that I can’t go forth; he has made my chain heavy. 8 Yes, when I cry, and call for help, he shuts out my prayer. 9 He has walled up my ways with cut stone; he has made my paths crooked. 10 He is to me as a bear lying in wait, as a lion in secret places. 11 He has turned aside my ways, and pulled me in pieces; he has made me desolate. 12 He has bent his bow, and set me as a mark for the arrow. 13 He has caused the shafts of his quiver to enter into my kidneys. 14 I am become a derision to all my people, and their song all the day. 15 He has filled me with bitterness, he has sated me with wormwood. 16 He has also broken my teeth with gravel stones; he has covered me with ashes. 17 You have removed my soul far off from peace; I forgot prosperity. 18 I said, my strength is perished, and my expectation from Yahweh. 19 Remember my affliction and my misery, the wormwood and the gall. 20 My soul still remembers them, and is bowed down within me. 21 This I recall to my mind; therefore have I hope. 22 It is because of Yahweh’s loving kindnesses that we are not consumed, because his compassion doesn’t fail. 23 They are new every morning; great is your faithfulness. 24 Yahweh is my portion, says my soul; therefore will I hope in him. 25 Yahweh is good to those who wait for him, to the soul that seeks him. 26 It is good that a man should hope and quietly wait for the salvation of Yahweh. 27 It is good for a man that he bear the yoke in his youth. 28 Let him sit alone and keep silence, because he has laid it on him. 29 Let him put his mouth in the dust, if so be there may be hope. 30 Let him give his cheek to him who strikes him; let him be filled full with reproach. 31 For the Lord will not cast off forever. 32 For though he cause grief, yet he will have compassion according to the multitude of his loving kindnesses. 33 For he does not afflict willingly, nor grieve the children of men. 34 To crush under foot all the prisoners of the earth, 35 To turn aside the right of a man before the face of the Most High, 36 To subvert a man in his cause, the Lord doesn’t approve. 37 Who is he who says, and it comes to pass, when the Lord doesn’t command it? 38 Doesn’t evil and good come out of the mouth of the Most High? 39 Why does a living man complain, a man for the punishment of his sins? 40 Let us search and try our ways, and turn again to Yahweh. 41 Let us lift up our heart with our hands to God in the heavens. 4:1 How the gold has become dim! The most pure gold has changed! The stones of the sanctuary are poured out at the head of every street. 2 The precious sons of Zion, comparable to fine gold, How are they esteemed as earthen pitchers, the work of the hands of the potter! 3 Even the jackals draw out the breast, they nurse their young ones: The daughter of my people has become cruel, like the ostriches in the wilderness. 4 The tongue of the nursing child clings to the roof of his mouth for thirst: The young children ask bread, and no man breaks it to them. 5 Those who fed delicately are desolate in the streets: Those who were brought up in scarlet embrace dunghills. 6 For the iniquity of the daughter of my people is greater than the sin of Sodom, That was overthrown as in a moment, and no hands were laid on her. 7 Her nobles were purer than snow, they were whiter than milk; They were more ruddy in body than rubies, their polishing was as of sapphire. 8 Their appearance is blacker than a coal; they are not known in the streets: Their skin clings to their bones; it is withered, it has become like a stick. 9 Those who are killed with the sword are better than those who are killed with hunger; For these pine away, stricken through, for want of the fruits of the field. 10 The hands of the pitiful women have boiled their own children; They were their food in the destruction of the daughter of my people. 11 Yahweh has accomplished his wrath, he has poured out his fierce anger; he has kindled a fire in Zion, which has devoured its foundations. 12 The kings of the earth didn’t believe, neither all the inhabitants of the world, That the adversary and the enemy would enter into the gates of Jerusalem. 13 It is because of the sins of her prophets, and the iniquities of her priests, That have shed the blood of the just in the midst of her. 14 They wander as blind men in the streets, they are polluted with blood, So that men can’t touch their garments. 15 Depart! they cried to them, Unclean! depart, depart, don’t touch! When they fled away and wandered, men said among the nations, They shall not live here any more. 16 The anger of Yahweh has scattered them; he will no more regard them: They didn’t respect the persons of the priests, they didn’t favour the elders. 17 Our eyes still fail, looking in vain for our help: In our watching we have watched for a nation that could not save. 18 They hunt our steps, so that we can’t go in our streets: our end is near, our days are fulfilled; for our end has come. 19 Our pursuers were swifter than the eagles of the sky: They chased us on the mountains, they laid wait for us in the wilderness. 20 The breath of our nostrils, the anointed of Yahweh, was taken in their pits; Of whom we said, Under his shadow we shall live among the nations. 5:1 Remember, Yahweh, what has come on us: Look, and see our reproach. 2 Our inheritance is turned to strangers, our houses to aliens. 3 We are orphans and fatherless; our mothers are as widows. 4 We have drunken our water for money; our wood is sold to us. 5 Our pursuers are on our necks: we are weary, and have no rest. 6 We have given the hand to the Egyptians, To the Assyrians, to be satisfied with bread. 7 Our fathers sinned, and are no more; we have borne their iniquities. 8 Servants rule over us: There is none to deliver us out of their hand. 9 We get our bread at the peril of our lives, Because of the sword of the wilderness. 10 Our skin is black like an oven, Because of the burning heat of famine. 11 They ravished the women in Zion, The virgins in the cities of Judah. 12 Princes were hanged up by their hand: The faces of elders were not honoured. 13 The young men bare the mill; The children stumbled under the wood. 14 The elders have ceased from the gate, The young men from their music. 15 The joy of our heart is ceased; our dance is turned into mourning. 16 The crown is fallen from our head: Woe to us! for we have sinned. 17 For this our heart is faint; For these things our eyes are dim; 18 For the mountain of Zion, which is desolate: The foxes walk on it. 19 You, Yahweh, remain forever; your throne is from generation to generation. 20 Why do you forget us forever, And forsake us so long time? 21 Turn us to yourself, Yahweh, and we shall be turned. Renew our days as of old. 22 But you have utterly rejected us; you are very angry against us.